It’s PSU review Thursday! 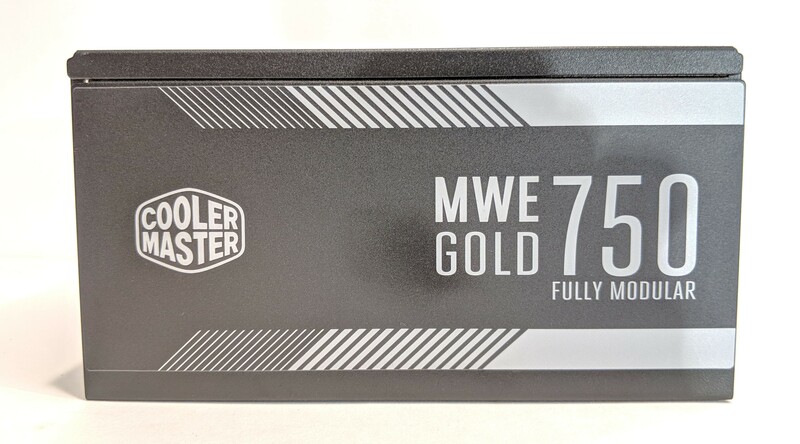 This time we’ll be taking an in-depth look into Cooler Master’s MWE Gold 750 Fully Modular Power Supply. The MWE series features both modular and non-modular internal cable designs and comes in both 80+ Gold and 80+ Bronze. 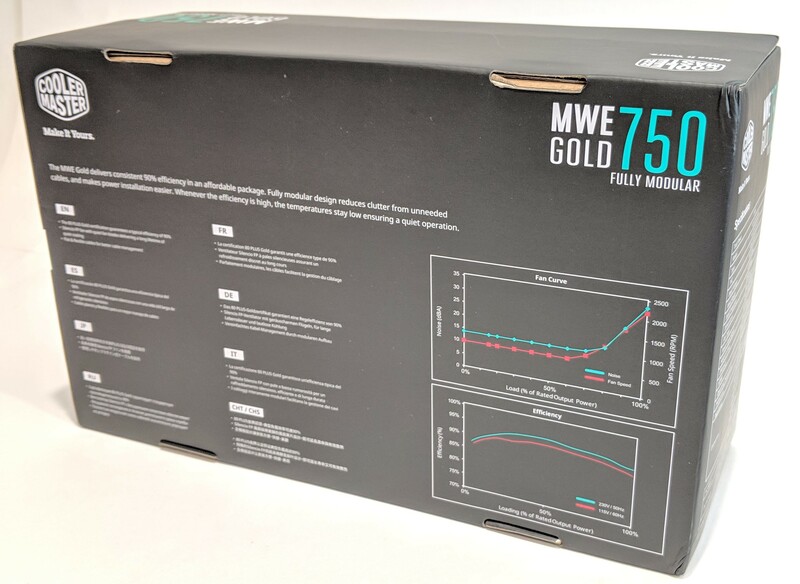 The MWE Gold 750 is rated at (you guessed it) 750W output and and carries the 80+ Gold efficiency certification. This means that the PSU has an efficiency rating of at least 87% (idle/max). 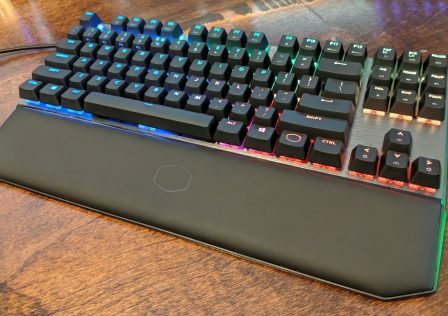 We’ll dive into power efficiency and why it’s important later in the review. A fully modular power supply allows the user to attach and detach the unit’s internal cables. Generally, these are preferred to fixed-cable power supplies as installation and cable management is a bit easier on the user. 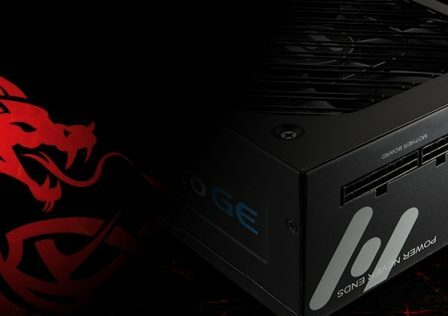 Since this power supply carries a 750W rating, it is a perfect target for users with a single high-end GPU setup. 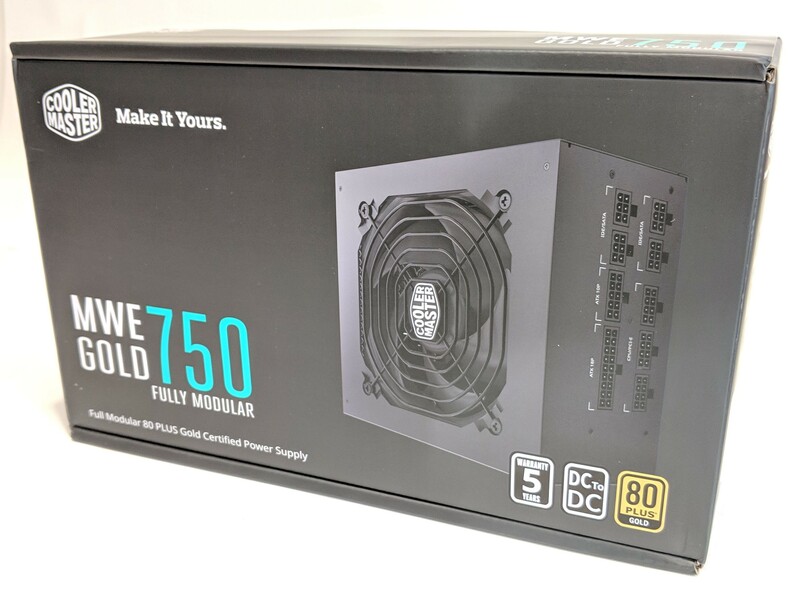 MSRP for the Cooler Master MWE Gold 750 Modular PSU is $99.99 USD. 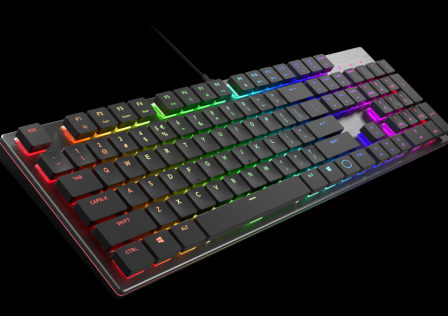 More information about it can be found over at Cooler Master’s product page. Next, let’s dive into the PSU a bit more and examine some if it’s features and details. As mentioned earlier the MWE Gold 750 carries a 750W rating. 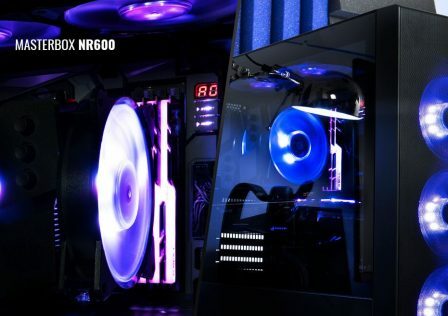 Cooling is provided by a single Silencio fan located at the top of the unit, the same fan we recently saw on Cooler Master’s new Hyper 212 Black Edition CPU cooler. During the review we tested noise levels and minimum and maximum speeds and found the fan to be overall VERY quiet. Because of that, we expect this PSU to be near silent even at high loads. 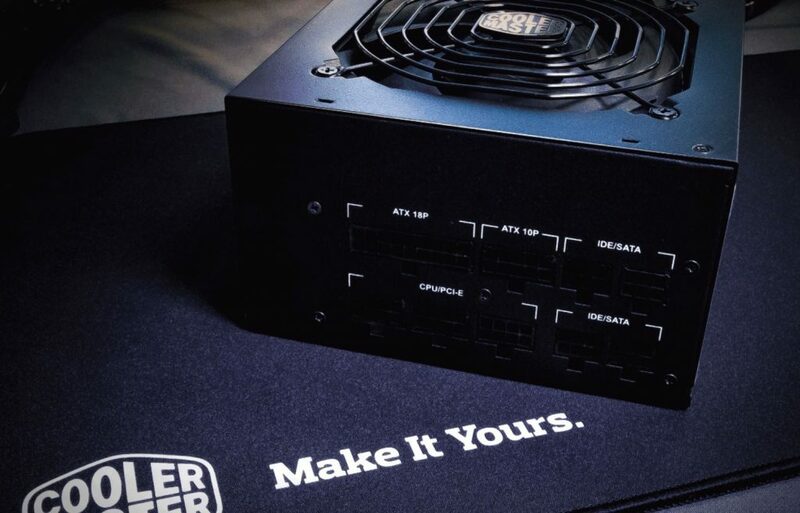 Cooler Master backs the PSU with a 5-year replacement warranty. Next, let’s crack open the packaging and get a better look at the unit! The box itself came shrink wrapped in plastic to protect the box from scratches and scuffs. 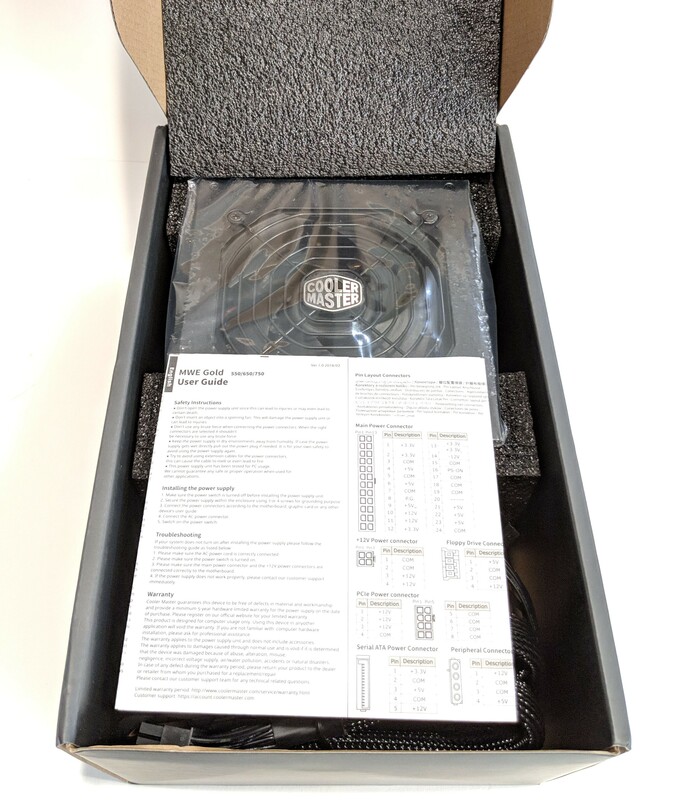 The front of the box features a cool graphic of the PSU itself with a bit of information such as its 80+ Gold rating, DC to DC technology and that it’s fully modular if you couldn’t tell from the image. The back features a brief description of what you’re buying as well as a graphic of the fan curve and efficiency ratings based on load. Moving over to the right side of the package there’s a handy graph providing the detailed specifications of the PSU. Be sure to look this over before picking it up to ensure system compatibility. After cracking the seal and opening the box, we can see a bit more as to how this PSU is packaged. 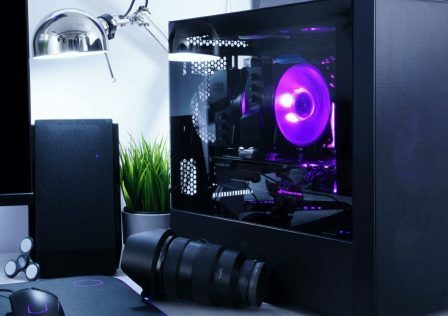 The PSU is nestled inside a bed of custom black foam on all sides. The rest of the included items such as a 115V power cable and internal modular cables are isolated from the main unit. A handy user guide is also included which gives detailed pin-out information. Overall, packaging is excellent and should survive “most” UPS/Fedex encounters during shipping. With everything out of the box, we get a better look at what we’re working with. 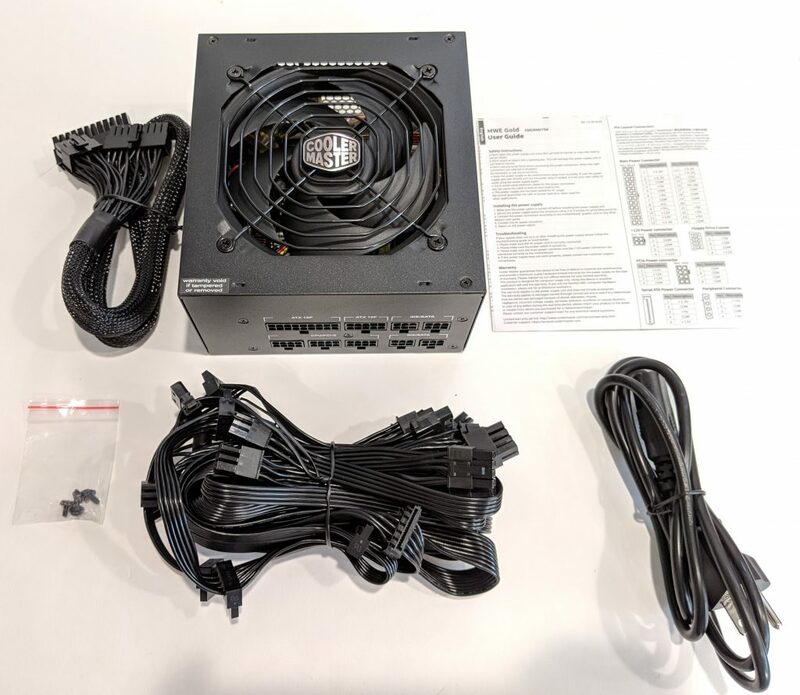 Included is the PSU itself, modular cables, a wall power connector, four Philips screws for installation into the case, and a user guide. The Power Supply itself features an overall stealthy black design. Its power-coated surface has a nice rigid texture to it which should withstand years abuse during installs and uninstalls. 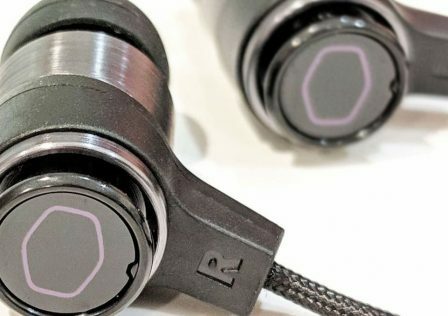 It’s modular connectors can be found here. One interesting thing to note is that the 24-pin motherboard power connector has been split into two separate connectors. I’m not sure as to why, but my best guess is to allow for easier cable removal and/or to provide cleaner power to the motherboard as there are more pins on the PSU side than the motherboard. More pins equals a greater contact area which translates to a more stable power delivery. The reverse side of the PSU is where you’ll secure the unit to the case using the four provided screws. A connector for the wall power plug and power toggle switch is also located on the back. 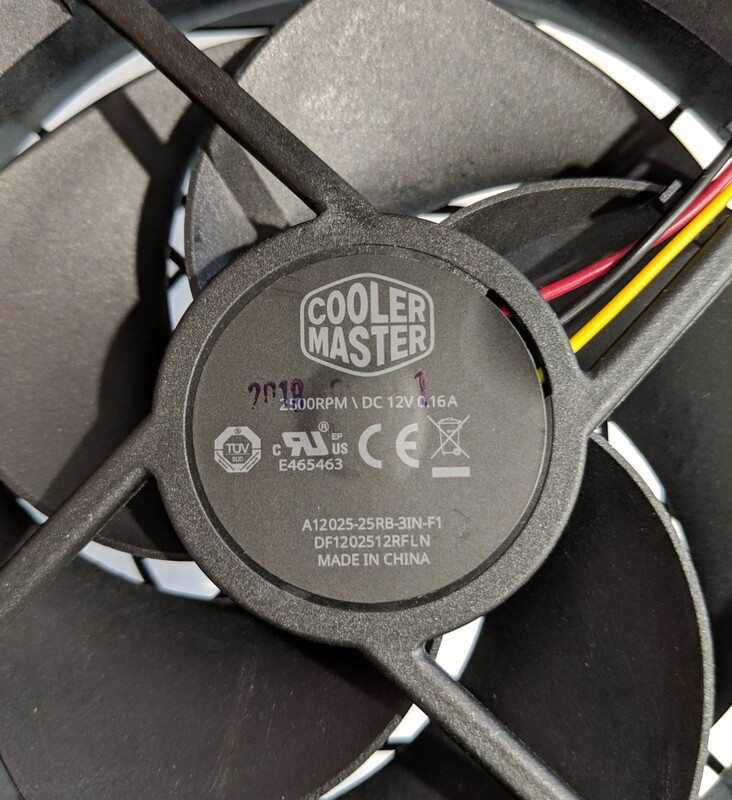 Lastly, the right side of the PSU features cool graphics featuring the Cooler Master Logo, subtle graphics and its model number. This side will be seen when installing the PSU in a bottom mounted case. We mentioned earlier that the MWE Gold 750 is cooled by a single Silencio fan. 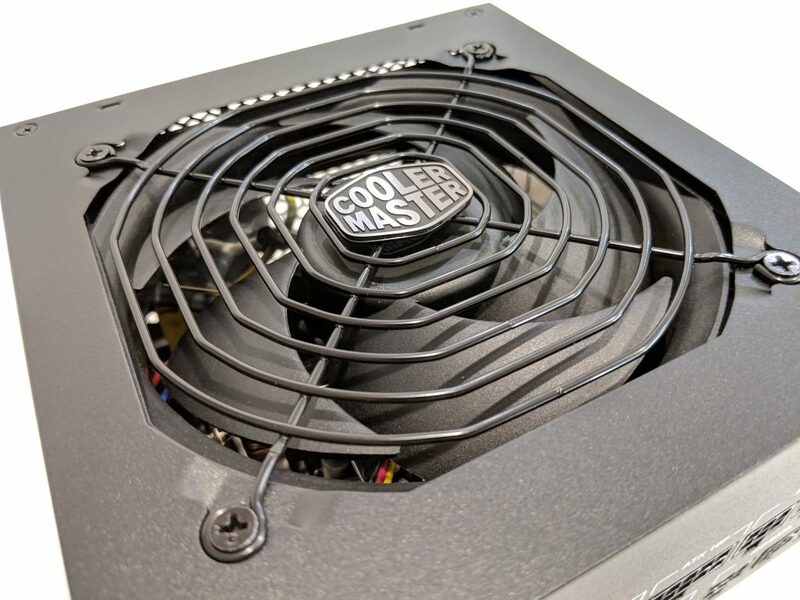 The fan sits behind a metal wire shroud with a Cooler Master logo in the center. The fan appears to be a 120mm, but we’ll know for sure once we disassemble the unit. A Word of Caution: Never open a PSU especially after it has been powered on recently. Residual voltages may still be present. There are no user-serviceable parts inside the PSU. 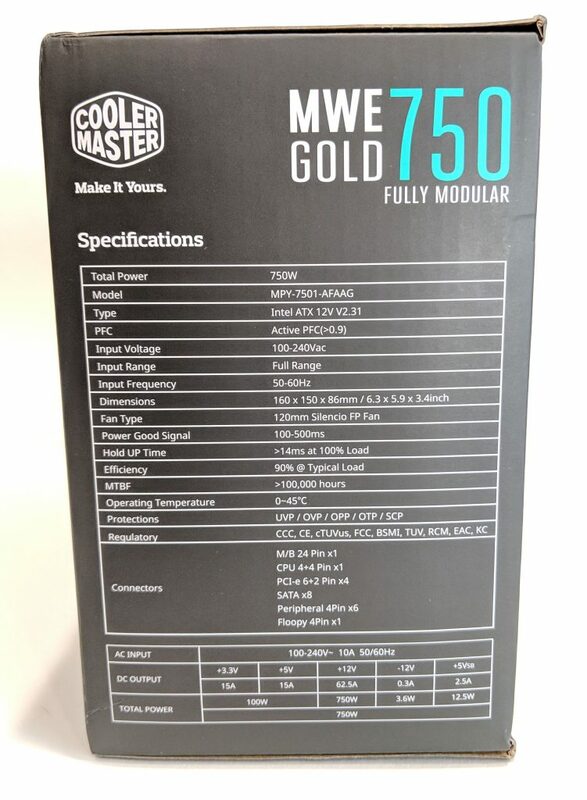 After voiding the warranty and unscrewing the top cover, we are presented with the Cooler Master MWE Gold 750’s electronic circuitry. At a glance, there’s no obvious red flags such as sloppy soldering or loose wires. The heat sinks for the VR and MOSFETs are constructed from machined aluminum and appear adequately sized. Typically, we like to see a bit more isolation and even more bonus points if each has its own dedicated heat-sink. It’s overall design is a common reference design seen on Xilence and Patriot PSUs to name a few. The center transformer (TZ-ERL39-H03) appears to be adequately sized. The main filter capacitor (two would be better) is rated at 330uF at 400V. Again good soldering all around as you can see in the images below. 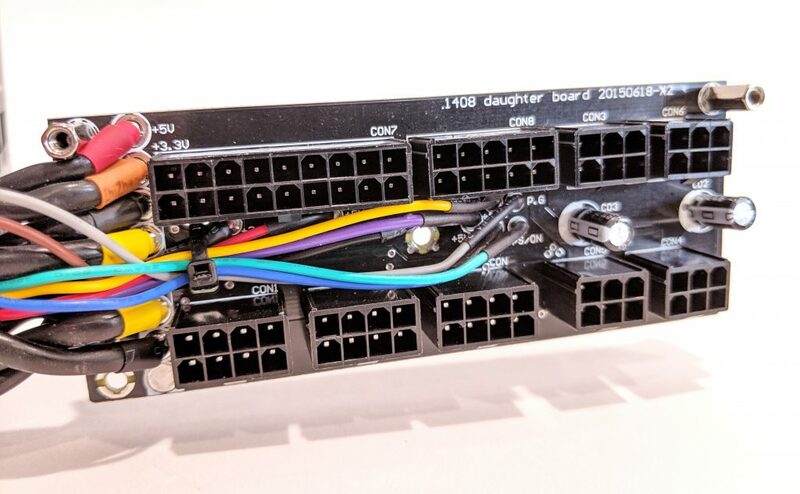 These are the main power cables which run from the main PCB to the daughter board which provide modular connectivity. The reverse side of the PSU’s motherboard looks good. no nasty blob soldering and everything looks clean. 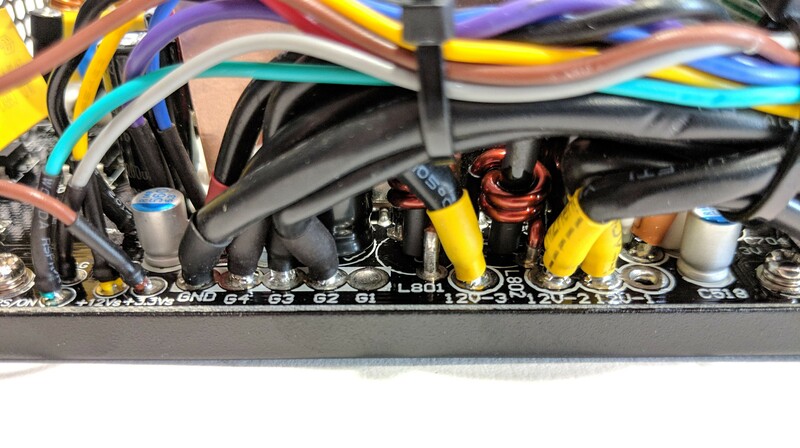 The daughter board used for modular cable connectivity connectivity also looks well built with good clean solder flow. A few extra capacitors were added here to help with smooth power delivery. Overall, pretty average internals. Sure, they’ll likely handle sustained stress just fine, but there’s nothing extraordinary or over-built about the MWE Gold 750. The Fan (A12025-25RB-3IN-F1) is indeed a Cooler Master Silencio fan. It’s got a 2500RPM rating which runs off 12V and has a very low current rating of 0.16A. The fan appears to be regulated via voltage rather than PWM as it uses a 3-pin interface. 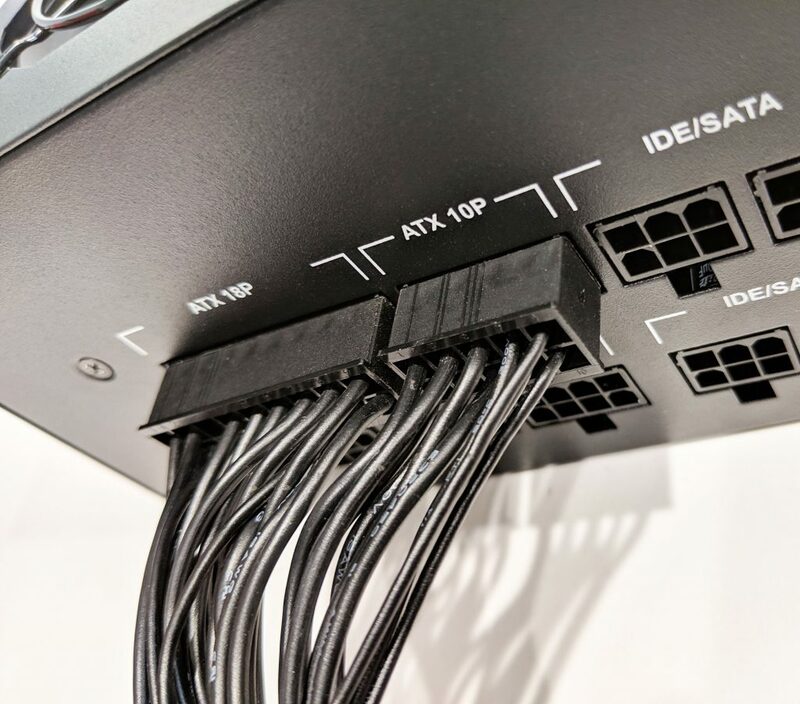 The modular cables are either braided (24-pin motherboard) or flat style (all others). Their overall build quality is fine. I particularly like the flat cables as they allow for easy cable management. The flat cables that came with the MWE Gold 750 are very flexible and easy to manipulate. Each of the cables you plan on using must be plugged into the PSU into its corresponding plug. Ensure a tight fit and that they are clipped into place. Now that we’re all MWE Gold 750 certified experts, let’s put this thing through the ringer to see how it handles some stress. 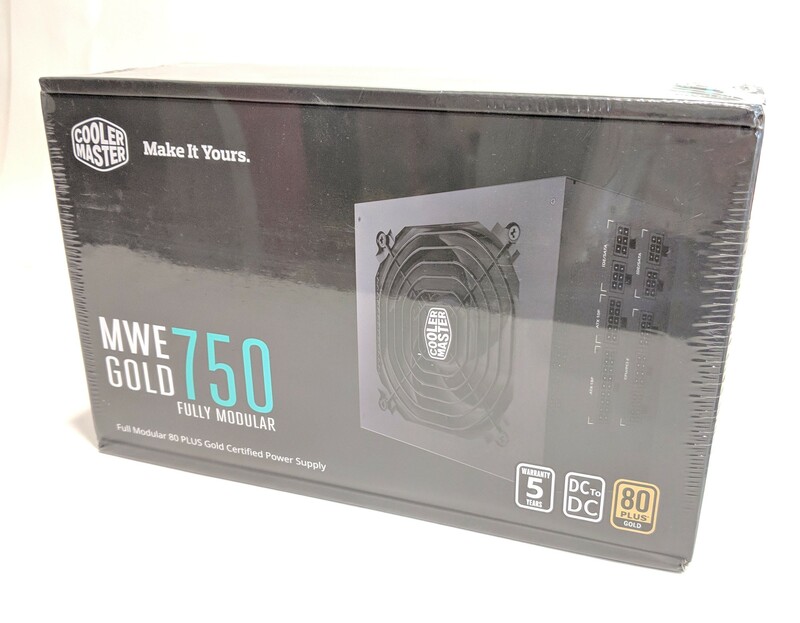 A word about efficiency – As we mentioned earlier, the Cooler Master MWE Gold 750 PSU holds an 80 Plus Gold efficiency rating. 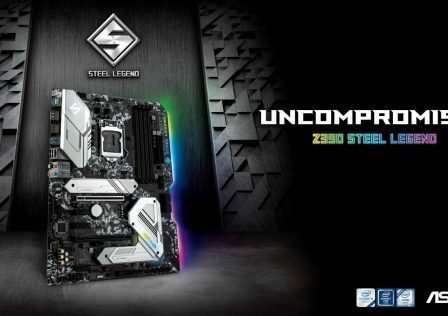 For a PSU on the lower end of the 80+ spectrum, this rating is pretty typical. 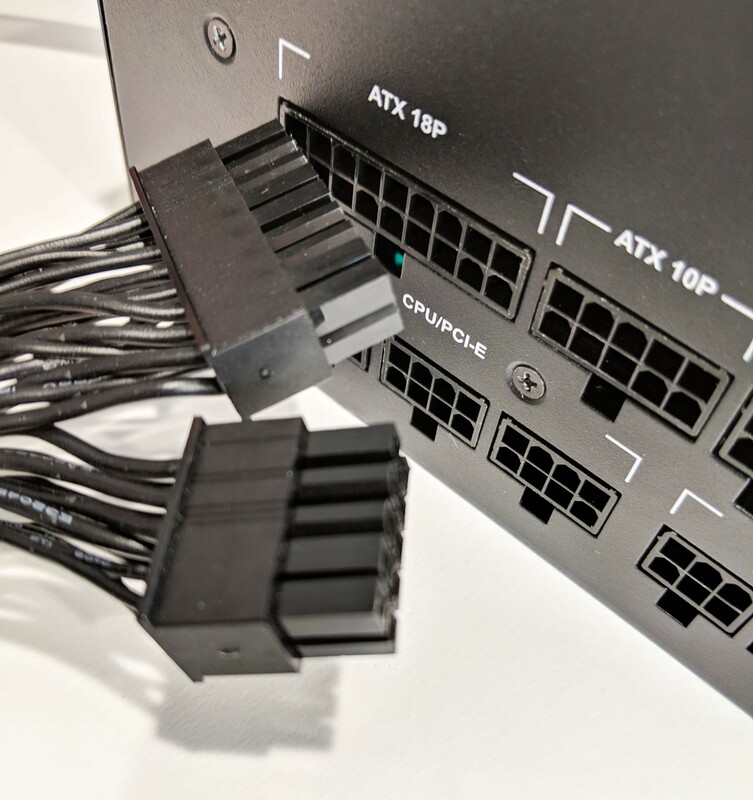 The PSU is rated at an 87% efficiency under a typical load (20/80%). 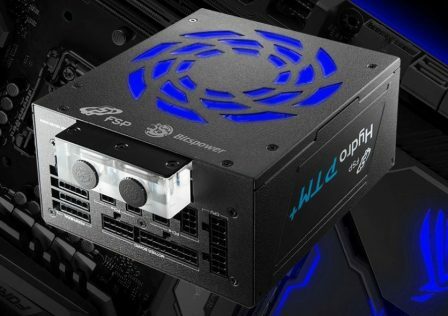 So what is PSU efficiency and why would anyone care how efficient a power supply is? Without getting into too much detail, efficiency in this sense is basically power in (from the wall) vs power out (to computer components). It is the cost to exchange one form of power to another. 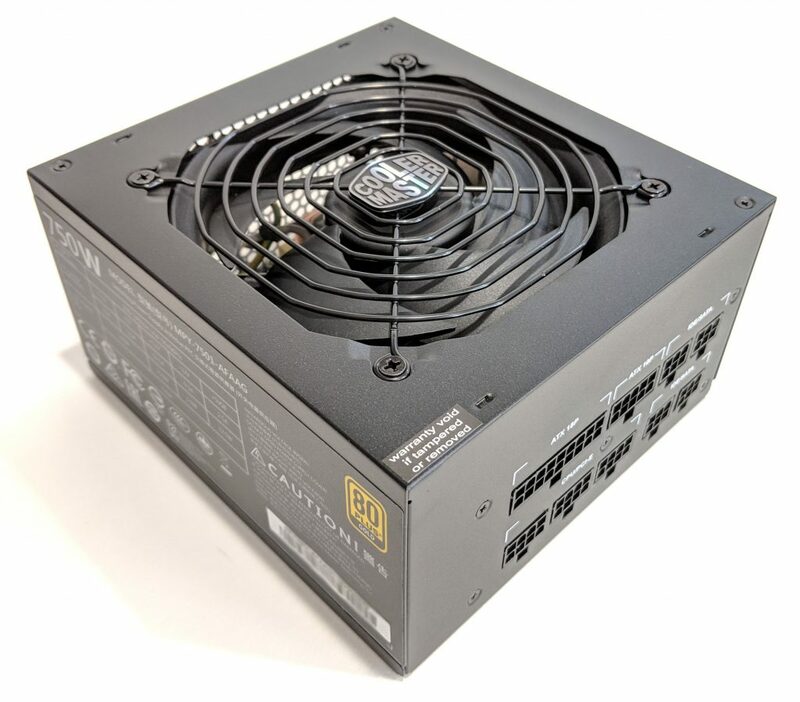 For instance, if you had a computer PSU that was rated at 400W, and is pulling 500W from the wall, then that PSU is 80% efficient. 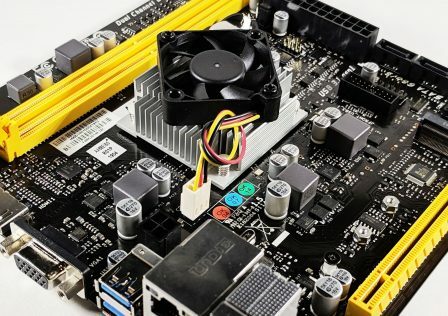 This is important for two reasons; one, a more efficient power supply will draw less current, meaning your computer will use less power overall. For the user running his machine at 100% constantly, will likely be shaving a few dollars a month off the power bill. This little amount will definitely add up over time. Second, a power supply with a high efficiency rating is likely built with higher rated components. These higher rated components can cause a power supply to run cooler and sometimes last longer. 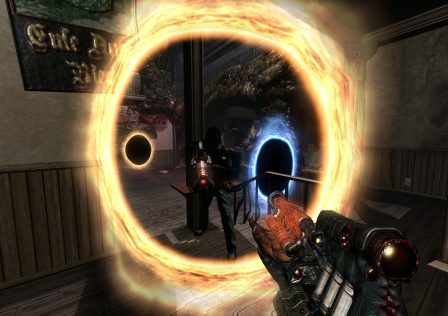 There are several factors we’ll be looking at during testing. One of the most important thing we look for is the behavior of voltage as the load on the PSU is increased. This is because when you see a voltage drop at mid to high loads, this can cause serious problems to internal computer components if the drop is significant enough. We will test this by incrementing up 50W for 10 minutes at each step. We will run each 50W increment as high as we can go before OCP kicks in (1050W if it will let us). 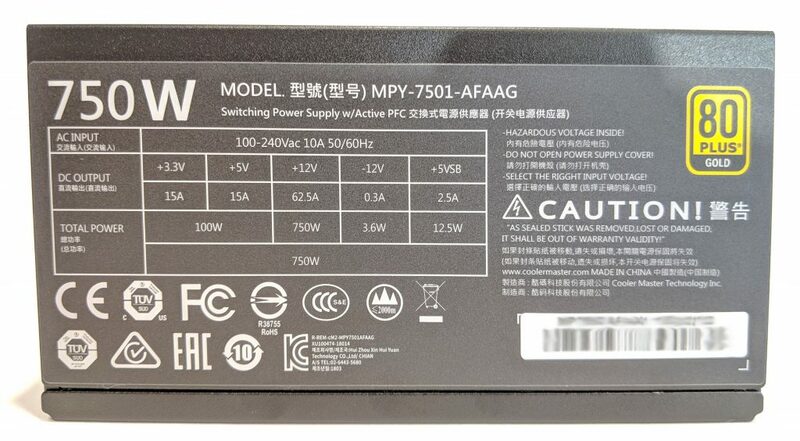 While this PSU is rated at 750W, there is a lot to be said for voltage stability past maximum ratings. 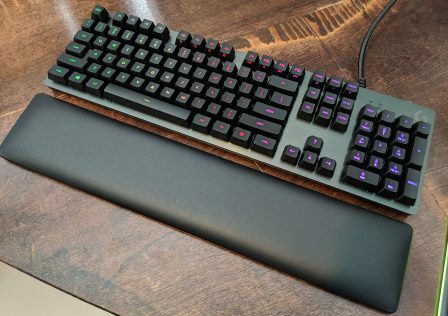 Although Cooler Master claims a 87% efficiency rating, we will also be performing our own efficiency calculations just to be sure. 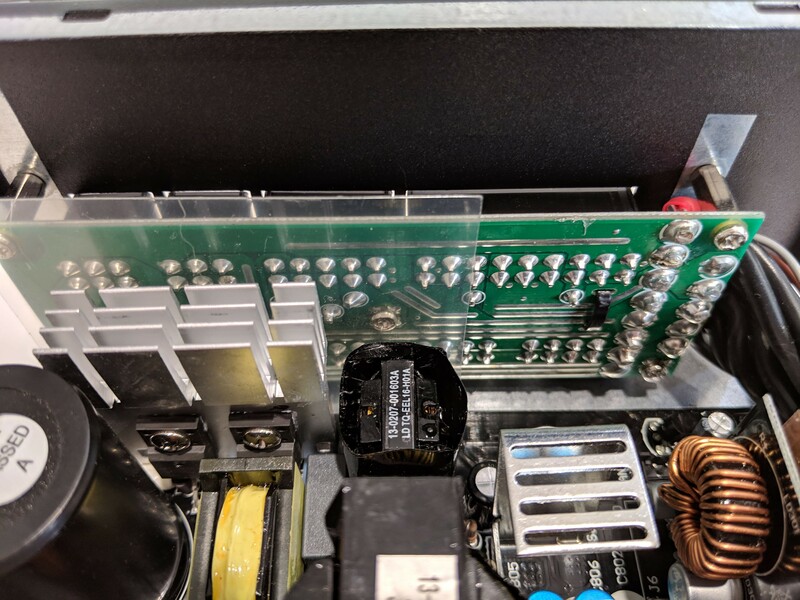 We will do this by placing a specific load on the power supply and then measuring the wattage going in to the power supply with our handy Killawatt meter. Now, let’s get ready to do some damage! And now for the test results. 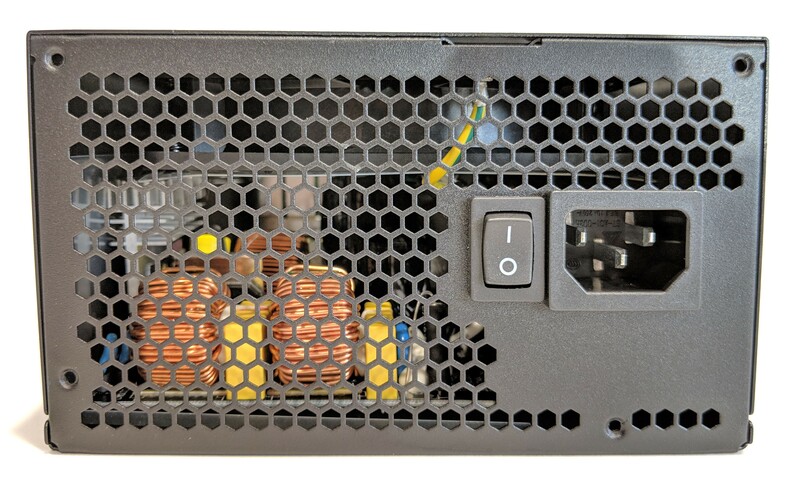 Drumroll please…..
Wait… this is a 750W PSU, why 850W?? Anything past 750W is the bonus round. 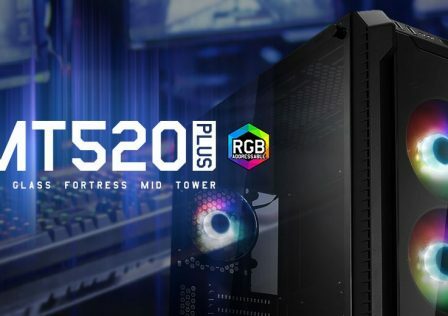 Officially, this PSU is rated at 750W and if it’s still providing good numbers after that then more power to it, if not, no biggie. 850W was the highest I could measure before OCP (Overcurrnt Protection) kicked in. This is good because that means that OCP is indeed working. 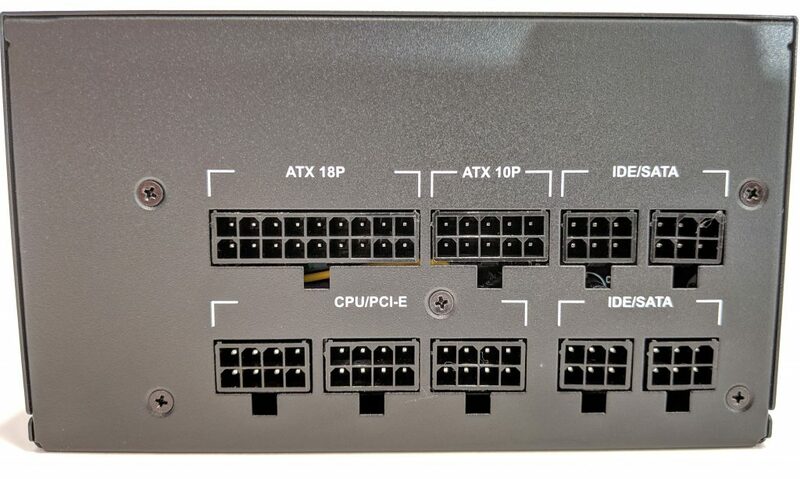 Some power supplies that we’ve reviewed in the past have stated that OCP is enabled, however we were able to take it 400W, 500W, 600W past it’s rating without any sort of fail-safe kicking in. So what do these numbers tell us? Ever so much… first let’s examine the 12V voltage drop. From 100 top 750 watts of load we only saw a voltage drop of 0.06V which is excellent. Noise is also very low throughout the test. 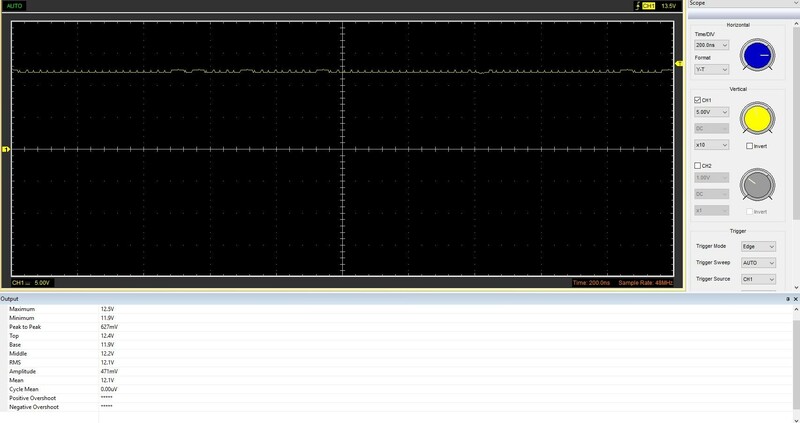 Our ripple test only detected a 367mV (milivolt) ripple at 100W, 390mV at 400W and 471mV at it’s maximum rating of 750W. Ripple in this case is measured from peak to peak. These voltage fluxuations are far from dangerous and will not interfere with internal components. 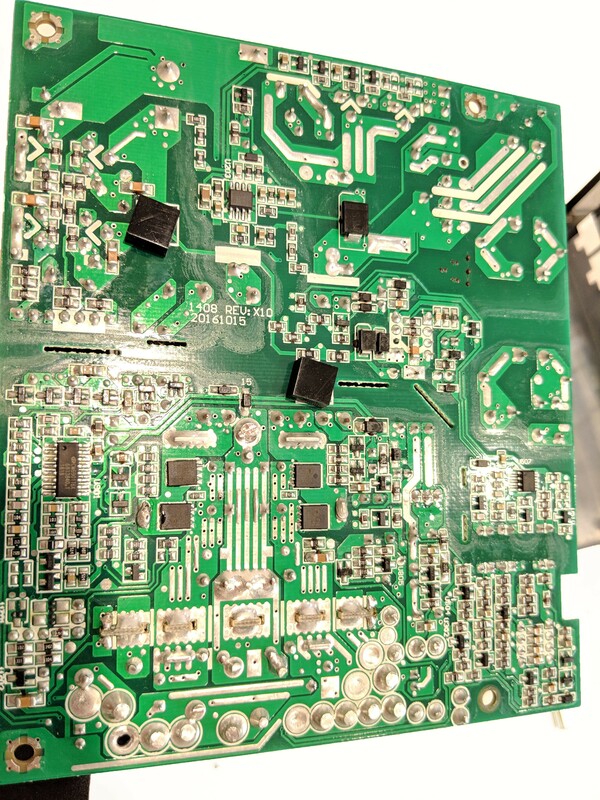 The image below was the 12V line at 850W of load applied to the PSU. Efficiency…. ouch. While the PSU was indeed almost platinum level efficient at low loads, higher loads yielded much lower results. 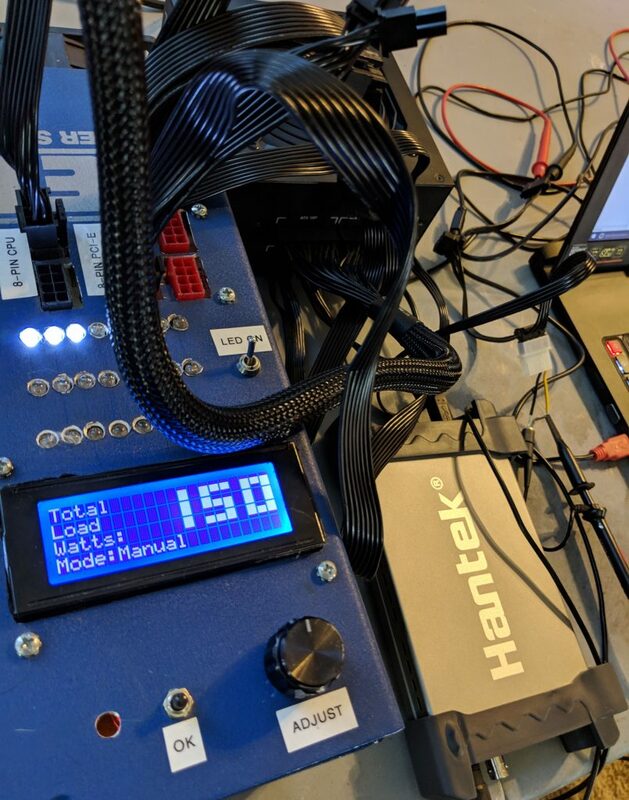 At the PSU’s maximum rated load of 750W, efficiency dipped down to 85.06% putting it a hair above the 80+ Silver category. 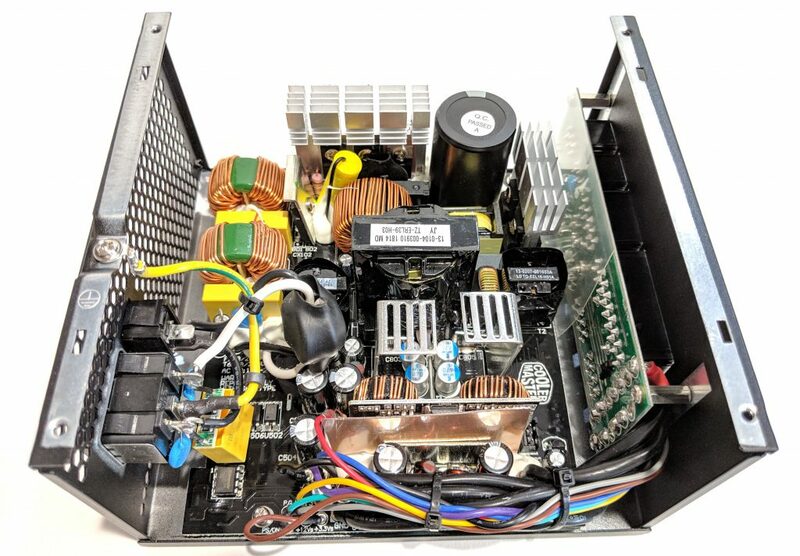 Anything past 450W, the MWE Gold 750 stopped being an 80+ Gold rated power supply. If you’re PC is going to sit idle 95% of the time, perhaps this graph is good news. 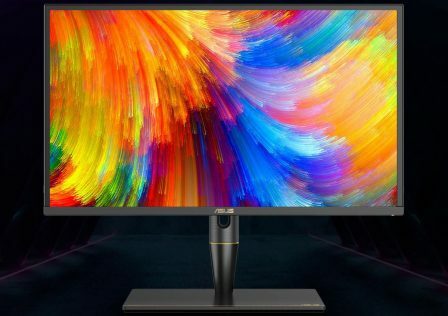 Almost 92% efficient at low loads is pretty impressive, However, the story changes dramatically if you’re planning on using this PC on a gaming rig or crypto miner that’s going to see some constant use. 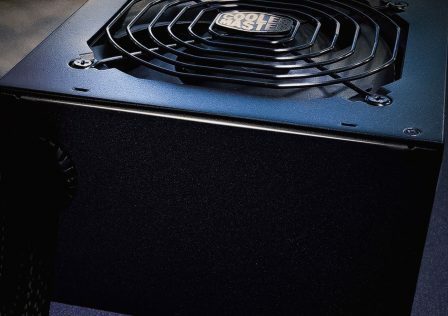 Cooler Master produced an affordable 80+ Gold rated fully modular power supply that looks and feels amazing did overall pretty well during our tests. The efficiency rating at high loads failed dropping down into the 80+ Silver category. +12V drop was excellent as well as peak-to-peak ripple. From the beginning, starting with the box presentation as well as packaging, you really do feel like you’ve purchased something special. Packaging was overall excellent, and the subtle stealthy look will go great with a blacked out or tinted build. The rugged, textured look gave off an almost premium feel of the unit. The fan and fan shroud were also high quality and made it feel like you were getting more than what you paid for. Appearance: 95/100 – From the PSU itself to its flat and/or braided cables, the unit really does look nice. Build Quality & Construction: 92/100 – There was no “cheap” vibe emitting from the PSU. Its construction inside and out was properly built and had a good weight to it. It’s cables were also easy to work with and felt like they could stand up to some serious abuse. Internally, I would have liked to have seen a bit more… something. Sure a single filter cap, and shared heatinks work bit a little extra sometimes goes a long way. 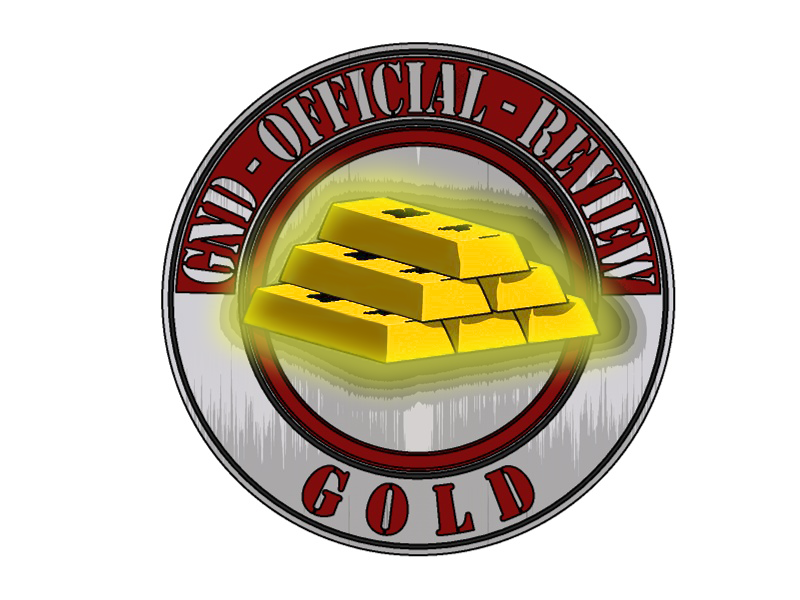 Performance: 76/100 – I loved everything about the MWE Gold 750 except for that damn efficiency rating at high loads. It’s like low load versus high load were complete polar opposites. At low loads, efficiency was borderline platinum level, however at high loads, efficiency was barely above silver. The PSU exceeded all other tests such as ripple and voltage drop. 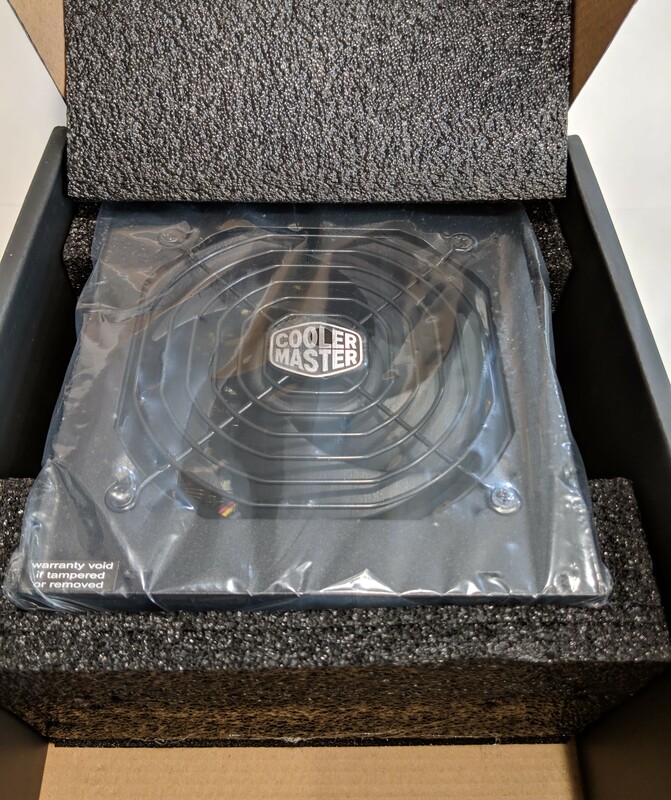 Value: 92/100 – MSRP for the Cooler Master MWE 750 Fully Modular PSU is set to $99 USD. This is about what you would expect to pay for a mid-range modular PSU. Based on the quality of the unit, performance results, this price definitely seems fair. 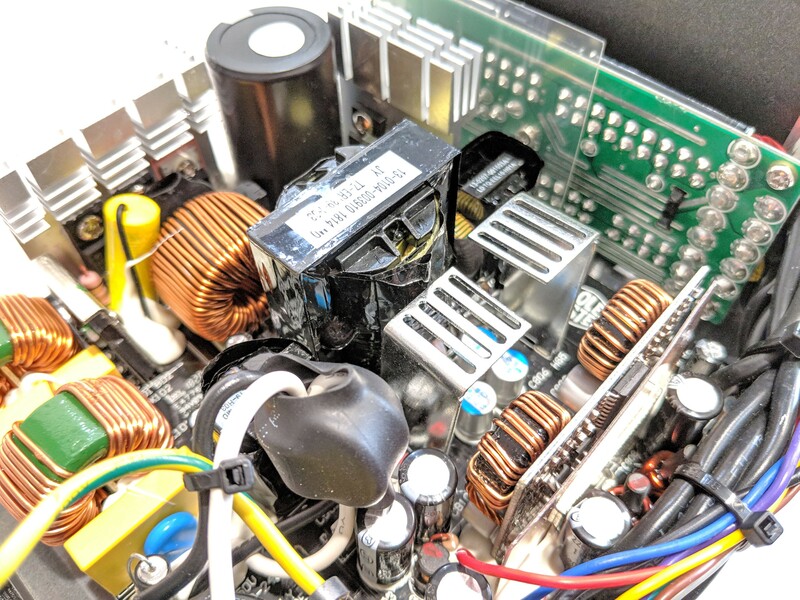 Cooler Master produced an affordable 80+ Gold rated fully modular power supply that looks and feels amazing did overall pretty well during our tests. Most power supply’s will lose efficiency as they are pushed. 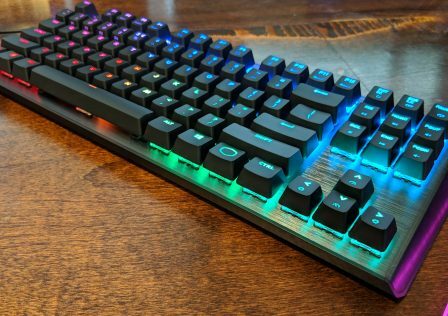 Never been a Cooler Master fan, but these numbers are excellent. 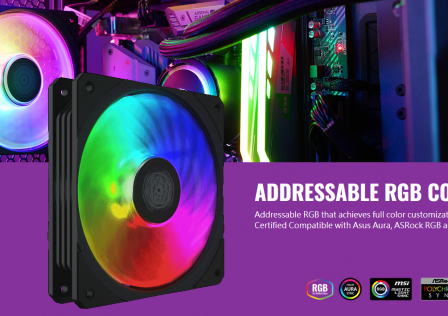 Looks like they are upping their game, much more than EVGA. Some nice deals out there on this series both before and after rebates. A great real-world option for most users. May try one myself after reading this. These are stellar figures for the price/performance. Efficiency overall is really quite good. Why does the reviewer have a bone up his arse for a power supply losing 2% when pushed to its limits? Are you for real? Not everyone can afford a $200 Platinum Digital Japanese unit. Not hitting the 80+ gold minimum rating at designated load intervals is cause for losing points imo as 80+ ratings work as a minimum scoring system. You gotta draw the line somewhere. Still, I agree a couple percent is no biggie at least for me. Its a solid unit and those numbers are good. I’ll hopefully end up getting one here soon. I’ll take this over EVGA any day. Lots of rebates around for this series which really makes it a great deal. What brand are all those capacitors? Teapo?